There has been a major shift in the UK’s viewing habits, with the number of UK subscriptions to television streaming services such as Netflix overtaking those to traditional pay television for the first time. Ofcom research also found spending by the BBC, ITV, Channel 4 and Channel 5 on new, UK-made TV programmes fell to a 20-year low. At the same time, people are spending less time watching television: average daily viewing on the television set fell by nine minutes in 2017 – and is down 38 minutes since 2012. 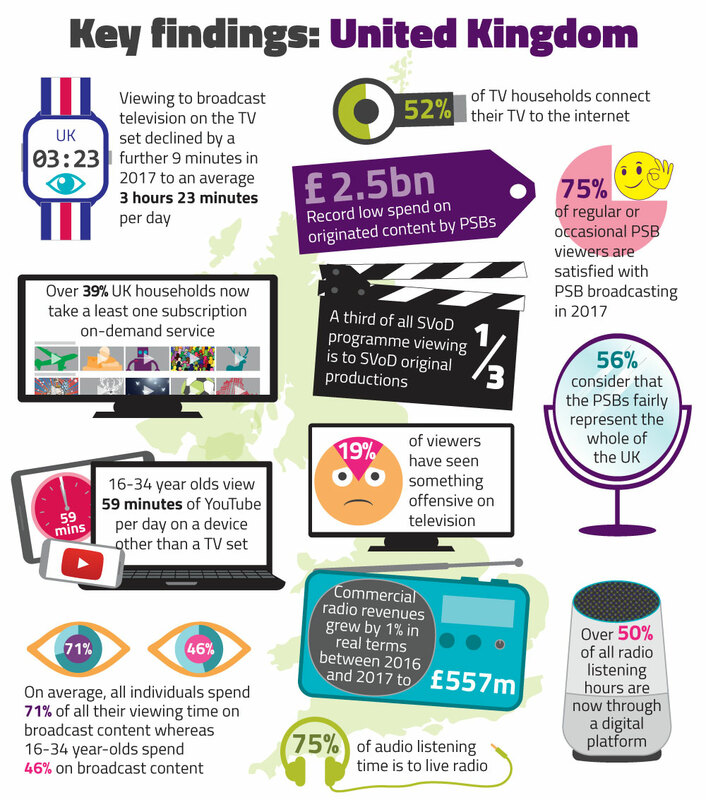 The findings are part of Ofcom’s Media Nations report, a comprehensive study of major trends in the UK’s television, radio and audio sectors, published today. UK subscriptions to the three most popular online streaming services – Netflix, Amazon Prime and Sky’s Now TV – reached 15.4 million in Q1 2018, overtaking the number of pay-TV subscriptions at 15.1 million. The BBC, ITV, Channel 4 and Channel 5’s £2.5bn combined spending on original, UK-made programmes in 2017 represented a record low – and is £1bn (28%) less than the 2004 peak of £3.4bn. An increase in funding from third parties towards the cost of programme-making has partly helped to offset this decline. The amount of time spent watching broadcast television on the TV set has continued to fall, and in 2017 stood at an average of 3 hours 23 minutes a day. This is down nine minutes (4.2%) on 2016, and 38 minutes (15.7%) since 2012. There were steeper falls among children and viewers aged 16 to 34, meaning the over-64s watched four times as much broadcast television as children in 2017. Total daily viewing time across all devices stands at 5 hours 1 minute, of which two-thirds (3 hours 33 minutes or 71%) was broadcast content, and 1 hour 28 minutes was non-broadcast content. However, among 16-34 year-olds, total daily viewing time in 2017 was 4 hours 48 minutes, of which less than half (2 hours 11 minutes or 46%) was to broadcast content, with just under an hour per day spent watching content on YouTube. Sharon White, Ofcom’s Chief Executive, said: “Today’s research finds that what we watch and how we watch it are changing rapidly, which has profound implications for UK television. “We have seen a decline in revenues for pay TV, a fall in spending on new programmes by our public service broadcasters, and the growth of global video streaming giants. These challenges cannot be underestimated. The report also shows how increased take-up of superfast broadband and connected televisions is driving changes in how people watch TV. Across all devices, the UK’s total television and audiovisual viewing in 2017 reached 5 hours 1 minute per day. The majority of this (3 hours 33 minutes or 71%) was broadcast television, with the remainder (1 hour 28 minutes or 29%) non-broadcast content such as YouTube and services such as Netflix and Amazon Prime Video. However, viewers aged 16-34 watched more non-broadcast than broadcast content – an average of 2 hours 37 minutes a day (54%) across all devices, compared with 2 hours 11 minutes (46%). As with video streaming, music streaming services such as Apple Music and Spotify continue to soar in popularity. For the first time, music industry revenues from online streaming subscriptions exceeded physical sales in 2017. Total retail music sales grew by 6% between 2016 and 2017, driven by a 38% increase in online streaming service subscriptions to £577m. In contrast, overall sales of physical music formats fell to £470m.The shift away from music ownership towards streaming was reflected by a 25% drop in sales of music downloads. Almost a quarter (23%) of adults listen to music via streaming services each week, rising to over half (51%) of those aged 15-24. Radio listening reached a significant milestone in the first quarter of 2018. For the first time, more than half of all listening hours (50.9%) were through a digital platform - DAB, online or through digital TV. This is being driven by an increase in ownership of DAB sets and the greater choice of national commercial stations now available to listeners.